The airframe covers the physical structure of the UAV required to achieve controlled flight. The engine and power systems will be covered in a separate section. The airframe chosen for a UAV will depend heavily on the expected mission profile. For example, a UAV that is to carry a 5kg payload for 2 hours will be far larger than a UAV that can carry a 1kg payload for 1 hour. 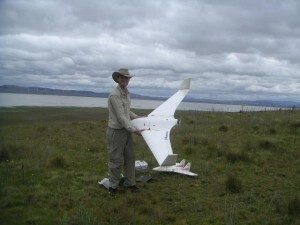 In general, smaller UAV’s a easier and cheaper to use. The airframe should be the smallest possible to complete the mission profile. For the vast majority of cases, a purchased airframe is better. This is due to known stable flight characteristics, easy access to spare parts, quicker construction time and cheaper to build. However, building your own airframe does have a few advantages. This includes being tailored for your exact flight mission profile, airframe having enough room for the electronics (some airframes have very little physical room for this) and the ability to optimise the efficiency of the airframe (leading to greater range/flying time). Thus, in general, it is a better option to purchase an off-the-shelf airframe. However, it may be worth looking at custom airframes is you have access to the fabrication equipment and suitably qualified team members. The are five major construction materials for UAV airframes. The emphasis is on cheap, light and readily available materials. Strength is less of a factor – a hard landing can easily damage the airframe. Foam – usually EPP or EPO type. They are similar the the syrofoam used in packaging. This type is used by most small electric aircraft. It tends to “bounce” after a hard landing, due to it’s elastic properties and thus is quite forgiving for less experienced pilots. Some glues and chemicals can dissolve the foam. 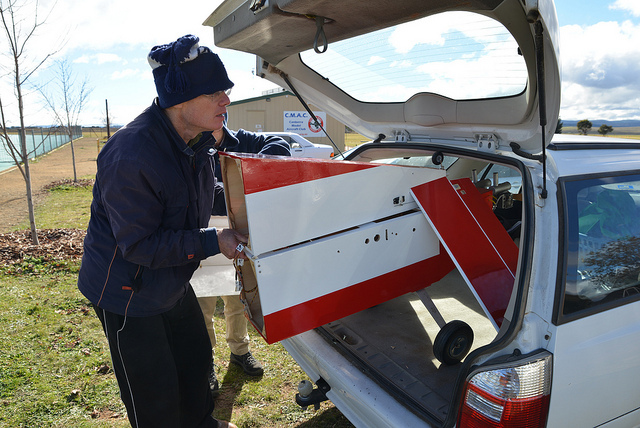 Any wings made of foam tend to need a wooden or carbon fibre spar, as the stresses of normal flight can snap the wing. Balsa/Plywood – Used in most gas/nitro planes. It is much stronger than foam in normal flight. It is less able to absorb energy in impacts, leading it to shatter rather than “bounce” like foam. Fibreglass – Usually used as a covering, as it is light and strong. Plastic – As with fibreglass, it is usually used as a covering for the wings or fuselage. Carbon fibre – Very light, strong and stiff. Due to the expense and difficulty of manufacture, it is usually only used for spars and beams. A tractor planform has the engine (and propeller) at the front of the airframe. Thus the engine is “pulling” the aircraft along. A Pusher planform has the engine at the rear of the aircraft, where is “pushes” the aircraft along. A Flying Wing has no clear fuselage section, rather the area between two thick wings are used as a small “fuselage”. Every airframe has performance limitations. These are based on the physical size, shape and weight of the airframe. The maximum operating wind speed refers to when the wind speed is fast enough to limit the safe maneuverability of the UAV. 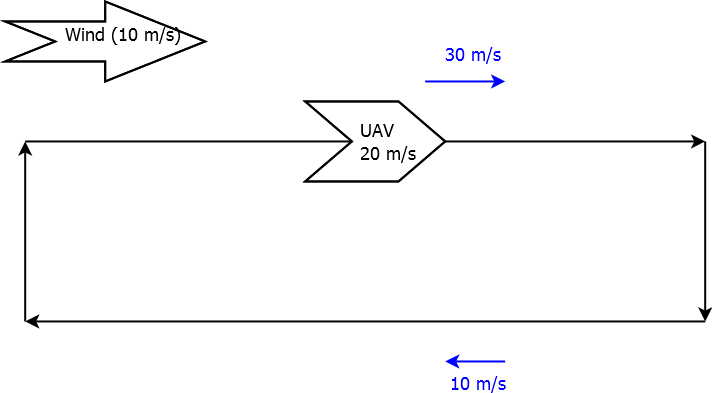 In the below diagram, a UAV is set to cruise at 20 m/s airspeed (velocity relative to the wind). Translating this to speed relative to the (stationary) ground, the UAV will travel one side of the pattern at 30 m/s and the other side at 10 m/s. Beyond a certain windspeed, the UAV will no longer be able to make any progress along the ground. Any sudden turns into the wind will significantly stress the wings and fuselage too. 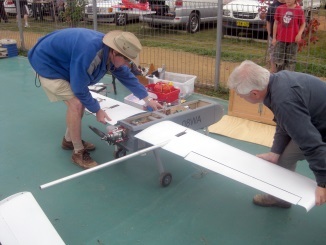 Due to an UAV needing to bank (roll) into a turn, stresses are placed on the wings. This is due to the centripetal forces acting on the wings (and also the fuselage, but the wings are the weaker of the two). Where v and r are the velocity and radius of the turn respectively. 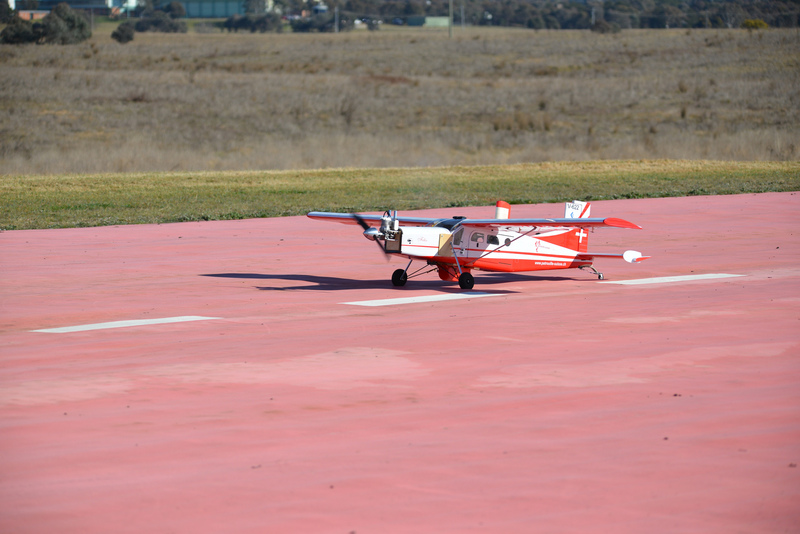 For example, an UAV turning about a radius of 50m must do so at a airspeed less than 38 m/s. The exact g limit of an airframe will depend on it’s construction. The desired maneuverability of the airframe should be taken into account when choosing an appropriate airframe. In addition to the aforementioned turn radius, the maximum climb rate and stability (when fully loaded) should be tested to ensure it fits with the desired requirements. The stall speed is the minimum airspeed of the airframe before the wings can no longer produce lift. Below this speed, the airframe will tend to “drop out of the sky” and recovery is difficult at low altitudes. Accordingly, this effect is mostly encountered during takeoff and landing, where the airframe is close to the ground and traveling at a low airspeed. The stall speed should be programmed into the flight controller and known by the pilot (when flying manually) in order to decrease the chance of a crash due to stalling. The lower the stall speed of the airframe is, the more stable the airfame is at these lower speeds, but this can come at the cost of a less efficient airframe at higher speeds. In terms of launching (takeoff) and recovering (landing), there are a few options. Each method has it’s own advantages and disadvantages, and may only be applicable for certain types/sizes of airframes. Bungee (launch) – The airframe is pulled along a short (5-10m) rail that is angled upwards. The pulling force is provided by a bungee cord. The airframe needs to be small/light enough to be accelerated to takeoff speed, such that it will keep on gliding when it run of the end of the rail. 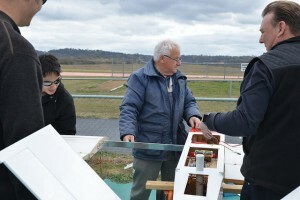 At this stage, the engine will be started and will propel the UAV further. This is a small and compact launch method. Road (launch and recovery) – This is a traditional approach used by full-sized aircraft, where the UAV will use it’s own power to accelerate down the road and takeoff. Similarly for landing, the UAV will (gently) land on the road and will use the rolling resistance of the landing wheels to decelerate. This method can be used for any size and planform of airframe, but does depend on there being a nearby flat and straight piece of road or track. In addition, the wheels and landing struts should be of appropriate size and strength to cope with the forces involved in takeoff and landing. Vertical (launch and recovery) – The airframe is able to takeoff and land vertically (or near-vertically), much like a helicopter. This method has the advantages of not requiring a large flat area for launch, and can scale to any size of airframe. The major disadvantage is the requirement of specialist airframe capable of vertical flight. Parachute (recovery) – When near the desired point, the UAV will slow to just above stall speed, deploy a parachute and cut the engine. It will then float gently to the ground. This method does not require a large area for recovery, but care must be taken to ensure the engine’s propeller (or airframe) does not be caught or tangled in the parachute. Net capture (recovery) – Similar to a parachute recovery, the aircraft will slow to just above it’s stall speed and then fly into a large net (similar to a volleyball next) and be caught in the next. 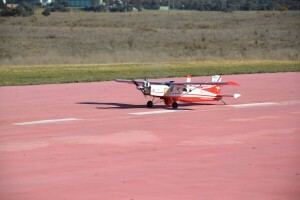 It does require a medium sized area to allow for the net and low-altitude approach of the UAV, but can be scaled for use with large and small airframe sizes. Hand Launch (launch) – Similar to the bungee launch, but it uses a human arm instead of a bungee. Whilst the engine is running, a team member will throw the UAV into a shallow climb. The UAV should then accelerate away. This is a very simple and compact launch method, but can generally only be used for <5kg UAV’s (depending of the arm strength of the person performing the launch). Care should also be taken to prevent the propeller coming in contact with the launcher. When choosing an airframe, two important considerations are the complexity of transporting it to the flight area and any associated setup. Larger airframes, in order to fit inside a standard-sized car, usually require a more involved setup – such as attaching the wings and assembling the fuselage pieces. 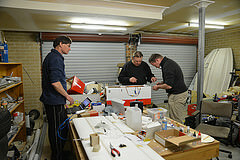 This in turn requires additional preflight checks to ensure the airframe has been assembled correctly (in particular the wiring).